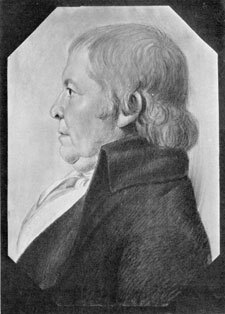 This article describes an exhibition on Paul Revere at the Museum of Fine Arts in Boston that was being showcased at the time the article was published. It notes the items on display, from Revere’s church silver to domestic items, and explains the relevance of each to his life. It originally appeared in the August 1942 issue of American Collector magazine, a publication which ran from 1933-1948 and served antique collectors and dealers. A special exhibition, “The Work and Environment of Paul Revere,” has just opened at the Museum of Fine Arts, Boston. American Collector readers will notice the coincidence with the appearance of Esther Forbes’ best selling book, Paul Revere & The World He Lived In — a graphic story of Boston during the Revolution and the early Republic. 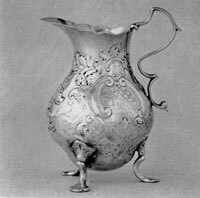 Pre-Revolutionary Revere Silver: Cream Pot made for Lucretia Chandler. Her husband, John Murray, a loyalist, fled to Nova Scotia. Their ship was overtaken by an American privateer and this cream pot was brought to Boston where it was sold at a prize court auction. Like the book, the museum’s exhibition is far more than a showing of Revere’s work. It brings together, much of it for the first time, a collection of rare early silver, 18th and 19th century American antique furniture, prints, needlework — one piece of which has been traced to Revere’s ownership by a descendant — and last but not least, an unparalleled group of Copley and Stuart portraits that not only give us impressions from the life of Revere and his wife, but also vivid character studies of the leading group of patriots in Miss Forbes’ carefully documented but lively study. These men would include Samuel Adams, John Hancock, James Otis, Joseph Warren, General Knox and others active in those stirring times, not unlike the present in their urgency. It was Warren who started Revere off on his famous ride; later it was Revere’s grim duty to identify his friend’s body, months after he had fallen at Bunker Hill, by two artificial teeth which he had made for him. Portraits by Stuart include those of Revere and his wife in their latter years, the rotund Henry Knox, famed for his almost superhuman feat of bringing the heavy cannons captured from the British at Ticonderoga to Dorchester — artillery that forced the evacuation of Boston; and Dr. Samuel Danforth, handsome and fearless Tory who remained in America and lived to see old enmities so far forgotten that he was the physician called to Revere’s deathbed in 1818. 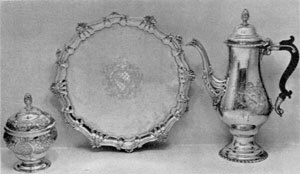 Revere Silver in Rococo Style: The sugar bowl and tray bear the Chandler coat-of-arms and the coffee pot that of the Sargent family. Then, too, the museum has gathered a considerable group of some of the finest New England furniture of the period, some of it made by Revere’s neighbor, John Seymour, from whose shop in Creek Lane came forth the cabinetwork that has given him the title of master of American tambour front furniture. There are also block front pieces of the Boston rather than the Newport style, some good Salem casework, and a group of 18th century chairs in that sturdy simplicity that was a hallmark of America’s best. A bow front chest of drawers, dating from about 1775, is also said to have been owned by the patriot, and has come to the Museum as a bequest of Mrs. Pauline Revere Thayer, a direct descendant, along with the needlework above mentioned — a pole screen with the panel showing a rustic park scene, with two lovers, a milkmaid in the background, and a church in the distance. St. Memin Portrait of Revere: This crayon drawing depicts him in his later years. This French artist did not come to the United States until 1795 and returned home in 1814. It is impossible to give in an exhibition of this sort, any adequate glimpse of Revere’s versatility, beyond silversmithing, rolling copper and working brass and engraving copperplate, making false teeth, setting up a powder mill, printing currency, casting bells and cannon, commanding a regiment, and overall engaging in continued and intense political activity. Nevertheless it is a showing of more than ordinary vividness, and of especial interest to antiquarians. A Revere Tea Set in Adam Style: These pieces were presented to Edmund Hartt, constructor of the frigate Boston. The sugar bowl bears the presentation inscription and the others his monogram. This historic piece has been lent by the Massachusetts Historical Society. Then there is the famous tea set in the Adam style made for Edmund Hartt, builder of the frigate Boston, and also the Constitution or “Old Ironsidcs,” for which ship Revere furnished the copper. Here also is a fluted covered sugar bowl from Revere’s own Charter Street house, and willed by him to his unmarried daughter, Harriett. A teapot made for Moses Brown of Providence is shown, with the receipted bill on which credit for turning in a salver is noted in the cost, evidence again of the melting down of earlier plate for new fashioned pieces. This Moses Brown piece is also entered in one of the Revere daybooks, precious lists of documentary evidence that have caught more than one swindle in counterfeit Revere silver. These journals are still owned by the family and are carefully guarded. On one open page, among other things, can be seen a bill in 1765 to “Mr. John S. Copley. To a Gold Setting for a Picture, to the Making, to the Glass.” Here is one more testimony of Revere’s versatility. 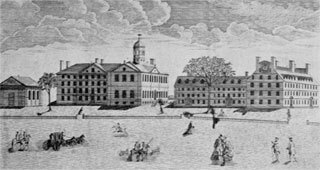 Revere's Print of Harvard: Engraved after Joshua Chadwick, this print bears the title beneath the view, "A Westerly View of the College in Cambridge." The buildings depicted are Holden Chapel, Hollis, Harvard, Stoughton, and Massachusetts halls. It is fitting, too, that Copley should have painted Revere as a vigorous young man, in his shirtsleeves at his bench, a tea-port in hand, engraving tools nearby, the silver resting on a leather pad to protect it while working. Considered by many to be the finest of the Revere portraits, its reproduction, unfortunately, has not been permitted for this showing. Under the picture the Museum has placed a very similar teapot, with identical inverted oviform shape and spout, but with repoussé work of a type that the silversmith might have added. This is also a family bequest. Exhibited also are the Harvard print by Revere, and several others from the famous Boston collection of Valentine Hollingsworth. Most interesting perhaps is the Boston Massacre print by Revere, shown here in two versions, and between what is thought to be the original Henry Pelham print from which Revere copied his plate. It is known that more than five hundred of Pelham’s version were printed, but none have been positively identified. Revere having captured the Boston market, it is quite possible that they were shipped to sympathizers in England and used in 1770 in W. Bingley’s Short Narrative of the Horrid Massacre in Boston. In defense of Revere it must be said that pirating of print designs was common at the time. Also, by 1774 the two had again become fast friends. In the midst of all these objects, Esther Forbes worked for a number of years, fortunate in the fact that John Singleton Copley was a precise, unflattering portrayer of character. Here in the magnificent gallery where the Revere portrait takes the leading role, the other actors, truly men of action, are seen as in the eyes of their contemporaries. It is this fact, along with the shrewd and careful arrangement of the entire show by the Museum curators, Edwin J. Hipkiss, W. G. Constable, H. P. Rossiter, and Miss Gertrude Townsend, that make it an important event. I have a sterling silver (marked) bowl. The “Liberty Bowl” quite large, marked Paul Revere, dated 1763 (I believe this is the date) and the words Exemplar stamped on it. It this an original bowl and not a reproduction? There are some hallmarks on it as well as a what appears to perhaps be a lot number of maybe 4 digits. I have seen a sterling silver bowl which shows “Cartier Paul Revere Reproduction Sterling8153 5IN”. Is it a product made by Paul Revere? Did Paul ever make furniture?I know of an eight legged couch with ornate carving said to be connected by documentation to Paul Revere.Could be by his Friend who was a Master Carpenter and furniture maker?I told the owner this piece could be very valuable as Americana Furniture.